You get caught out all the time, with sickness out there, snow-blind…so you take birch bark, make holes in there; that will protect your eyes. Athabascan hunters and travelers used a variety of forest materials to make goggles and eye masks for protection against snow glare, including wood, birch bark, and bear skin. 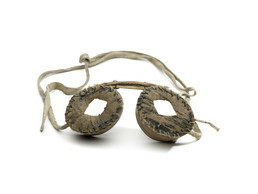 This pair of goggles was sewn from birch bark with a leather strap and a springy wooden bridge for the nose.